← When Detachment is Good! 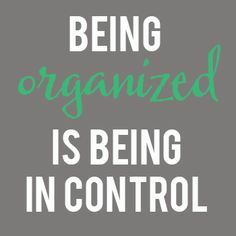 Why Should I Get Organized??? Less spending time for locating things. Setting a good example to others. Gaining a sense of self-control. Make more money and spend less money. More time to do the things you like. Hobbies, sports, TV, friends. Stress and frustration will be reduced. More time for the kids and/or partner. You may have more reasons and some may be very specific to YOU. But this is some examples of how NOT being organized doesn’t benefit you! So lets get organized!!! !